Something historic happened in Texas June 25. 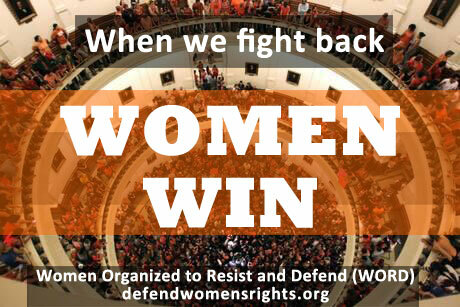 Texas women, spurred on by the support of women all across the country, refused to back down in the face of the latest assault on their rights. They flooded the capitol in what may have been the largest gathering in Texas history and disrupted a legislative session. According to right wing politicians they used “Occupy Wall Street tactics.” And guess what? THEY WON. This charge was spearheaded by Texas Democratic State Senator Wendy Davis, who should be congratulated for the personal stand she took (literally) in attempting to carry out a 13 hour filibuster to block a vote on a bill that would have effectively taken away access to safe, legal abortion for millions of Texas women. Davis went into that legislative session as a fighter. She wore sneakers and she brought a back brace, prepared to stand without leaning, sitting, food or bathroom breaks for 13 hours. The plan was to use parliamentary rules against the rest of the legislature, with the help of the other Democrats in the session. But by themselves, parliamentary games played by politicians could not win women their rights that night. During her heroic filibuster, Davis was cited again and again for ludicrous violations of their rules. She was cited for “germaneness” when she raised the Planned Parenthood budget issue. She was cited again when a fellow politician helped her with her back brace. She was cited for the third time when she dared to discuss a sonogram requirement in conjunction with the abortion bill. If the legislature is willing to admit that sonograms have nothing to do with abortions in this session, why did they pass a law requiring women to get sonograms before they can have an abortion last year? When she received her third citation, the one that ended her filibuster at around 10:00pm, an audible “Bulls**t!” rang out from the crowd of hundreds of women who had gathered to show support for Davis in the chamber. These women were joined by thousands of women in and outside of the capitol and hundreds of thousands of women watching the proceedings closely via livestream and social media. Women all across the country knew this was a crucial showdown. Women in New York City sent pizzas to the Texas state capitol to show support for the women protesting there. Thousands of women submitted pro-abortion testimony to Wendy Davis’s aides so that she could use it to pad out her 13-hour speech. The hashtags #SB5 and #standwithwendy were trending on Twitter all night. Once Davis’s speech was ended by parliamentary formalities, the masses of angry women stepped in. With less than 20 minutes on the clock, the state legislature began the roll call for voting on the bill. If they couldn’t vote before midnight, they could not pass this bill. Everyone knew something needed to be done. With over 120,000 people watching on livestream, the crowd erupted in the Texas capitol. The right wing politicians banged their gavels and called for order -- but they must have forgotten that where there is no justice, there can be no peace. The women in the capitol knew that all eyes were on them, that at that moment no elected official could save them and they had to act up to save themselves. So they cheered, they chanted, they booed and they disrupted that legislative session long enough to keep the vote from happening before midnight. Riot police were called to clear out the capitol, but the women would not go. They filled the rotunda. They refused to play by the rules of a system that would keep them oppressed. Their militancy and determination brought us a historic victory for all women. Republicans argued that despite the disruption, the bill was passed at 12:01, but it was declared invalid. Hundreds of thousands of people had witnessed what happened. The right-wing politicians couldn’t violate their own rules because the people would hold them accountable. History proves again and again: when the people fight back, the people win. There is a long tradition of disrupting hearings on women’s issues throughout the feminist movement. Our foremothers were once considered an “unruly mob.” That is precisely the kind of struggle that won us these rights to begin with. We must continue to build this movement. The fierce women of Texas have shown us the way. You do not have to be an elected official to fight for women’s rights. Just organize, organize, organize and refuse to go one step back! We will continue the fight in that spirit, in Texas and everywhere.